I begin today in a self-reflective state of mind at the urging of Kevin Cramer, who took umbrage over criticisms of Precedent Trump’s un-Christianlike behavior at George H. W. Bush’s funeral. Trump didn’t sing, recite the Apostles’ Creed, or offer Michelle Obama even one piece of candy. Apparently, he was fearful of violating her nutritional guidelines. Since she left Washington, Trump’s made cholesterol great again by relaxing school lunch rules. Finally, a kid can get a lard sandwich again. It was understandably difficult for the media to ignore the way Trump’s arrival put a damper on the funeral. When someone depresses folks more than a dead guy in a box, it’s news. Marilyn Quayle acted like someone cut the cheese. 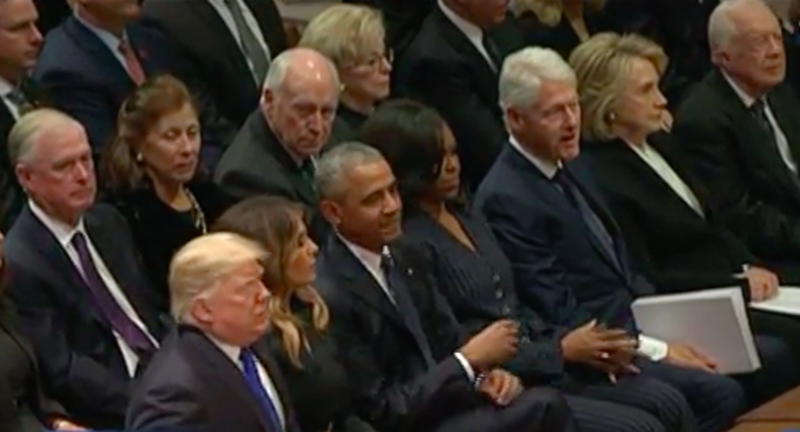 Even Darth Cheney gave Trump the stink eye, and when Cheney thinks you’re morally bankrupt, the bar doesn’t go any lower. “Our national mainstream media is pathetic,” Cramer complained. Well, duh. Cramer said the press should feel “privileged” to cover politicians. In other words, we should show some respect, and we do, but you might have to die first. After listening to the deification of 41, I wondered why he wasn’t on Rushmore or at least in the Roughrider Hall of Fame alongside Josh Duhamel, Harold Hamm and Tigirlily. After all, he did come to North Dakota’s Centennial and was by all accounts, nice. He was also knee-deep in the Iran-Contra scandal and was once director of the CIA, the counterpart to the KGB. Except when our guys torture people and overthrow democratically elected governments, it’s always for a good cause. Objectively, 41 was average. He was sort of the Cleveland Browns of presidents. When it comes to presidents, memory loss makes the heart grow fonder. Dubya committed a colossal military blunder by invading Iraq (after an attack by Saudi terrorists) and presided over a disastrous economic meltdown. Still, many look back fondly upon his reign of ineptitude. OK, but politicians don’t really have media “friends.” It’s generally an adversarial relationship. Sort of like matrimony. Sure, Cramer does have press agents posing as media, but I’m not sure they’re capable of introspection. Also, I’m not sure what “First Amendment abuse” means. Is that one of those mortal sin deals? If so, I’ll try to cut back. And I see no reason to bring the police into this matter. Somebody brought a keg and things got a little rowdy. Sometimes we forget our role is glorification of the state. Make America Great Again.